I dropped by Gallery Hanahou a couple of weeks ago while Lisa Grue was setting up the owl show. What an amazing exhibit, I have to tell you! 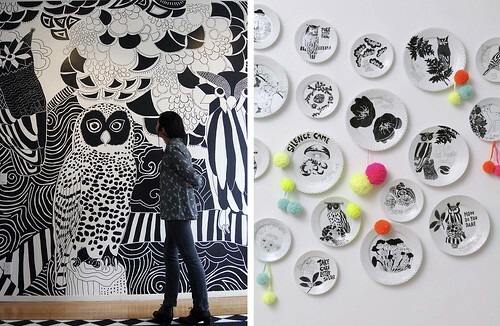 Some walls are papered with her incredible graphic pen work while on the opposing walls crisp white plates acted as canvas to that same detailed line work but on a much smaller scale. Throughout the space neon pom poms popped with lively color. It’s definitely work checking out if you are in NY. If not, peruse the flickr group and Lisa’s site. Thanks for the links and have a great weekend.